Check out the Express Entry video clip. 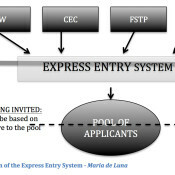 Express Entry is a new management system of current CIC programs such as the Federal Skilled Workers, Canadian Experience Class, Federal Skilled Trades, and SOME Provincial Nominees. If you do not qualify in any of those categories, then chances are, you cannot get through the Express Entry system. Think of Express Entry as a gate that limits entries of permanent residence applications. If you do not get invited through the Express Entry, you cannot continue with your permanent residence application.